Orlando is renowned for its big resorts and parks such as Walt Disney World, Universal Orlando and SeaWorld. Its easy to forget that behind all the rides and attractions, there lies a plethora of unique wildlife and amazing environments that cannot be matched anywhere else in the world. The swamplands of Florida are a great place to visit and get away from the loud noises of the theme parks giving you a chance to take in the sights and sounds of the real Florida. The most popular way of seeing this part of the area is by airboat, powered by a huge fan rather than a traditional underwater propeller. This allows you to zip along the surface of the water to keep an eye out for the native wildlife such as alligators, turtles and birds. 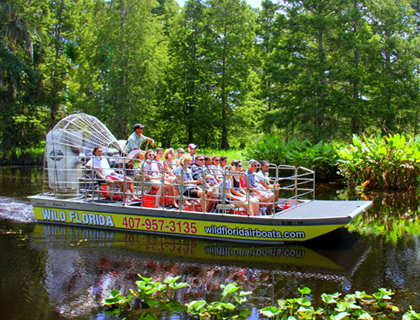 Airboat rides are one of the most popular providers of this experience and situated within 1 hour of Orlando’s main attractions, this has become a must-see on the itinerary of many tourists. Wild Florida pride themselves on offering a great experience for the whole family, giving the opportunity to see the real Florida.